Hot cocoa cookies for Santa! 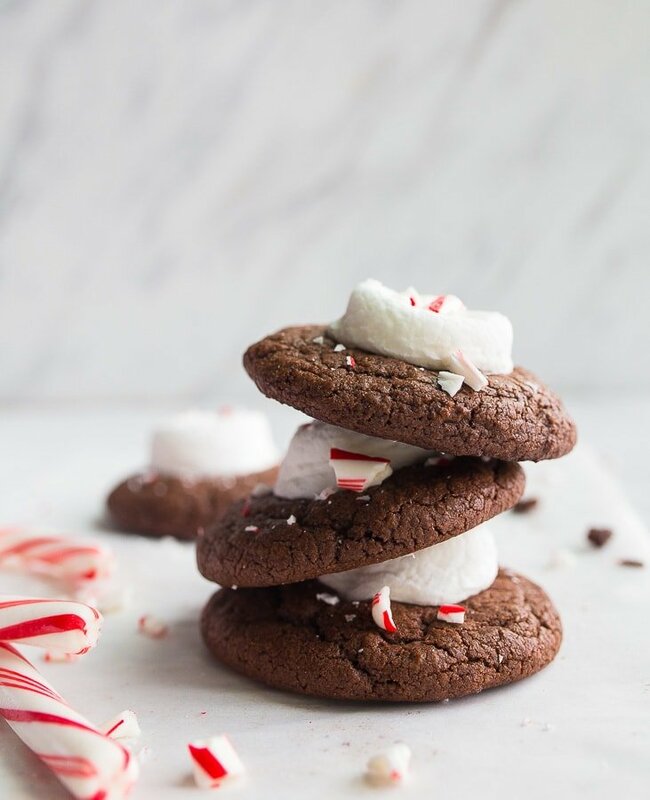 These rich hot chocolate cookies have a hint of peppermint, a gooey marshmallow, and crushed candy canes on top. Recipes makes 1 dozen cookies. 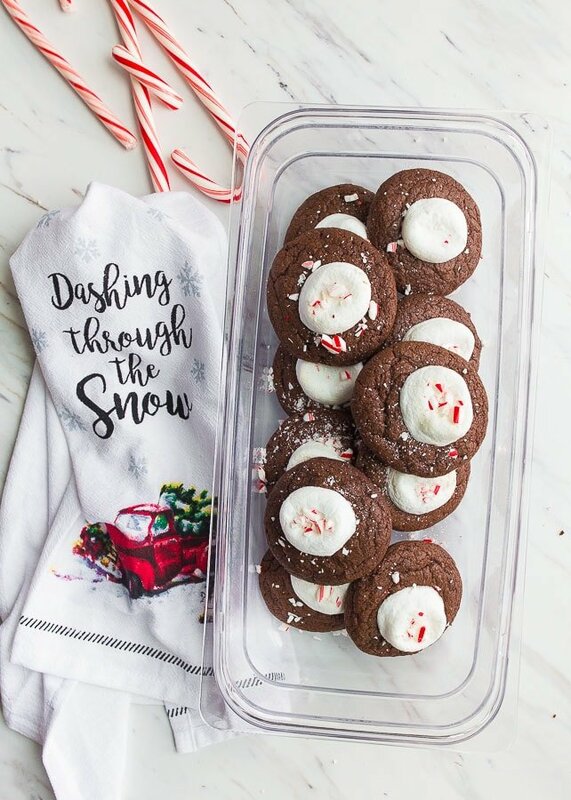 We’re not exactly dashing through the snow right now since we live in Texas (thank God), but we are dashing through the bags of powdered sugar, which is kind of the same thing. My daughter is requesting that we make every cookie recipe she sees a photo of as a ‘test for Santa.’ Apparently, only she knows which cookie Santa likes best. I’m sure you’re not surprised that Santa and Camille have the same taste in cookies. Christmas Lights Cookies and Christmas Sugar Cookies are their favorites, did you know? If there’s chocolate and marshmallows anywhere, there you will also find my kid. She knows that I prefer fruit desserts (like key lime pie) over chocolate, and as one of those kids who loves to copy Mom in all things, she’s perplexed. She wishes she could agree with me, and she tells people she likes fruit more than chocolate. But her love of chocolate always prevails. I have to avoid the baking aisle at the grocery store, because if she sees a bag of marshmallows, I’m done. So, when Camille requests a chocolate donut with a big puffy marshmallow from our local donut place, I’m happy to say that we can do better at home–in cookie form! 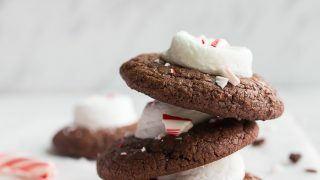 Hot cocoa cookies recipe with peppermint candy canes. 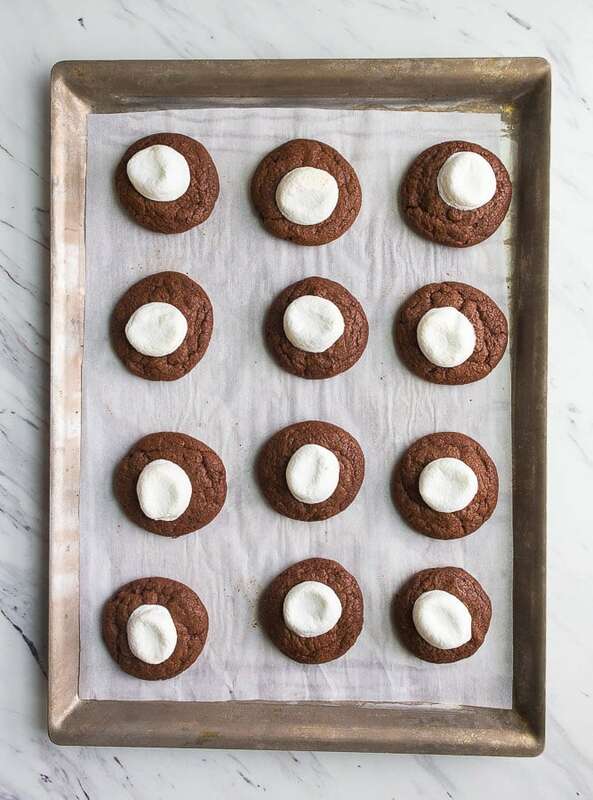 The chocolate cookie base to these hot cocoa cookies is one to save and remember for any other time you want a supremely rich chocolatey, chewy cookie! They’re great even without the marshmallow on top, and in that case, I would swap the peppermint extract for double the amount of vanilla. The chocolate cookie is made with both cocoa powder and melted chocolate. The double hit of chocolate is what makes these extra special. The peppermint extract, huge marshmallow and crushed candy canes on top is what makes them taste like a mug of peppermint hot cocoa. It can be tricky to melt chocolate chips, and I recommend the slow and steady double boiler approach. If you don’t have a double boiler, you can make one like I do all the time! To make a double boiler, bring a small pot of water to a simmer. Turn off the heat, and then place a metal bowl over the pan (never use a glass bowl). Add the chocolate chips to the bowl, and let the chocolate chips rest, undisturbed for a few minutes. Stir once, and let them melt all the way. That’s it–so easy! Plus, you don’t have to wash the pot because you only boiled water in it, ok? If you’re wondering why I don’t recommend a glass bowl, it’s because the heat from the simmering pan can crack the glass! It has happened to me twice, and now I use a metal bowl. If all you have is a glass bowl, make sure to tilt it to allow steam escape from the pan. I used to have success melted chocolate in the microwave using the 50% power function, but my new microwave has burned me a few times. It makes me too sad to throw away burned chocolate, so I use the safer double-boiler method. I used jumbo marshmallows split in half to top these cookies, but mini marshmallows would be cute, too. You first bake the cookies for about 8 minutes before putting the marshmallows on the cookies. The finish the last 3-4 minutes of baking with the marshmallows in the oven. If you want a toasty marshmallow flavor, use the broiler for 2 minutes instead. These cookies are quite large; I used a medium-sized cookie scoop to portion them between two baking sheets. Once baked, I placed them on one baking sheet for photos, but I recommend baking them on two sheets so they don’t spread while baking. 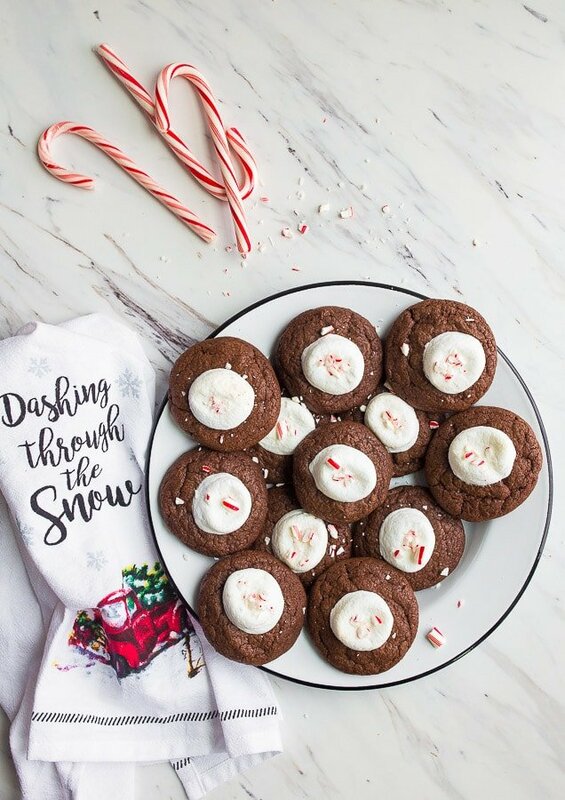 This recipe makes just 1 dozen cookies, which is the perfect amount for everyone to enjoy, plus a little plate for Santa. Don’t forget the carrots for his reindeer! Hot cocoa cookies with marshmallows on top. Preheat the oven to 350, and line two baking sheets with parchment paper. These cookies spread a lot, so it's best to only bake 6 on a sheet. Next, melt the chocolate chips. I do this in a double boiler: place a metal bowl with the chocolate chips over a pan of gently simmering water. Stir until the chips are fully melted, and then set aside to cool slightly. In a medium bowl, beat together with an electric mixer the softened butter and brown sugar. Beat until light and fluffy, about 2-3 minutes. Sprinkle the cocoa powder, flour, baking powder and salt evenly over the bowl, and beat gently just to combine. 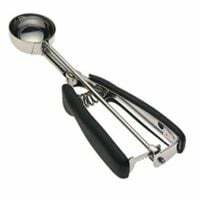 Using a large cookie scoop, divide the dough into 12 equal portions. Place only 6 scoops of dough on each cookie sheet for a total of 12 cookies. If you want to use a scale, 42 grams of dough per cookie is perfect! Meanwhile, snip the large marshmallows in half and set aside. After the cookies have baked for 8 minutes, pop a marshmallow on top of each cookie (sticky side down does the best), and slide the cookies back into the oven for 3-4 minutes--just until the cookies start to crack slightly and the marshmallow puffs and starts to melt. Remove the cookies from the oven; allow to cool on the rack for 1 minute before moving to a wire rack to cool completely. Decorate cookies with crushed candy canes. 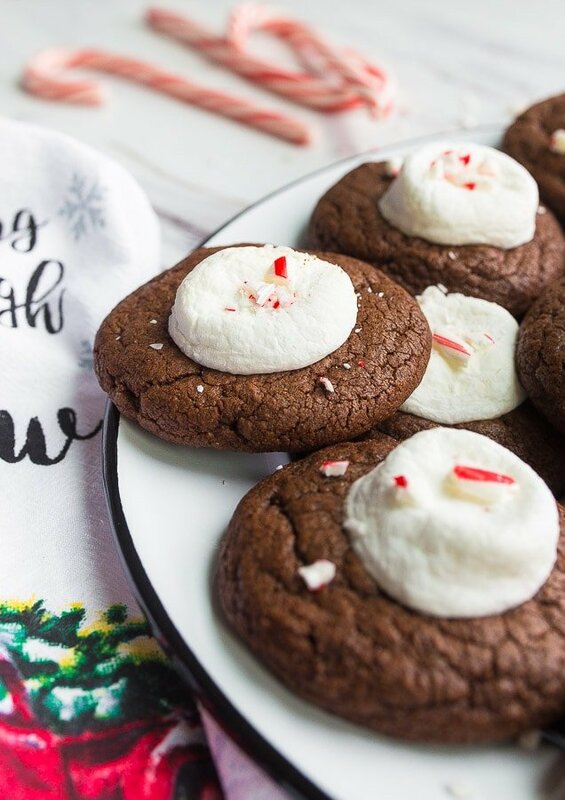 *You can make these with 1/2 teaspoon of vanilla extract instead of peppermint extract if you want traditional hot cocoa cookies. Christina, This question may be wierd… but can i make these cookies without the marshmallow? Thanks! One more question – how long do these cookies stay fresh? Camille has good taste. Desserts are meant to be chocolatey. Fruit is a yummy snack. These look great. Could I make this dough ahead of time (like, today) and refrigerate to bake it later (like, on Christmas Eve)? Or is is best to bake it right away? Hi Bethany! Yes, you can totally make this dough ahead of time and chill it. It’s easier to shape, too. After you roll the balls, press them flat before baking! 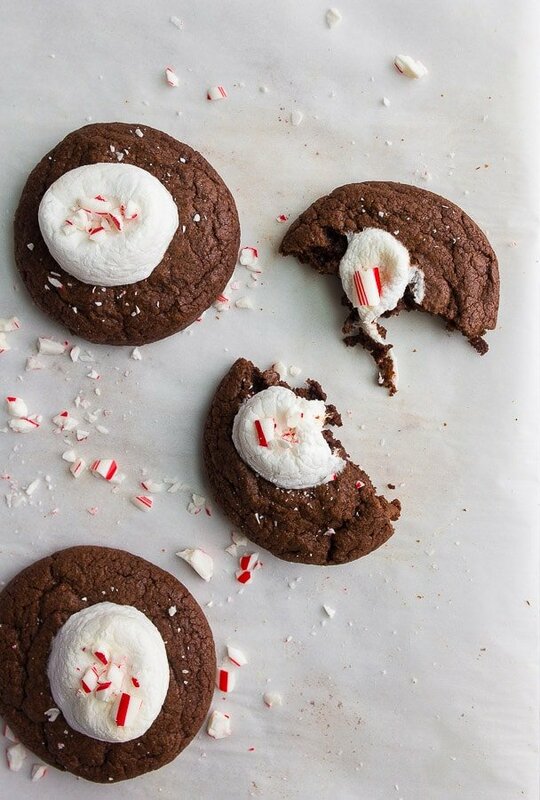 These look really good – love the idea of a hot chocolate cookie! Will be trying these soon. Well, definitely misinterpreted “large marshmallow” to mean “jumbo” so mine turned out about 50% cookie, 50% marshmallow. I’m not mad about it! The cookies are delicious either way. I remember when I was little we would make reindeer food. It was oats and glitter and we would sprinkle it on the lawn for the reindeer to eat. These look so good. I might make them to bring to work. Thank you for all the amazing small batch recipes you provide us. I’m actually not supposed to bake because my parents are on diets or something but I do it anyway. That’s why I like small batch baking.